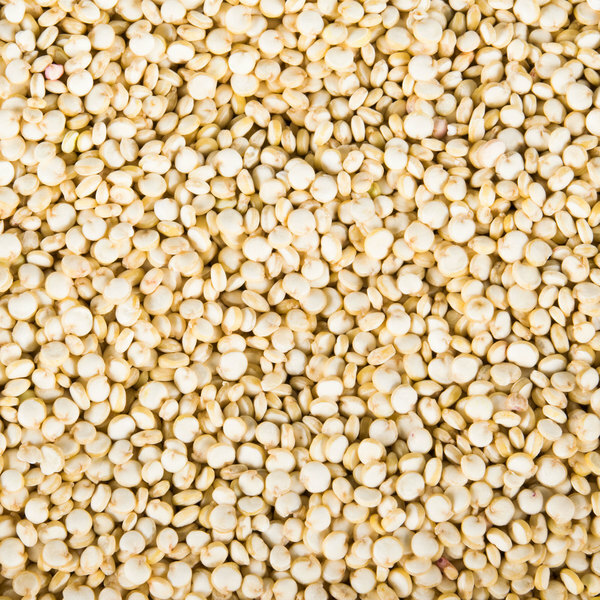 This organic white quinoa makes a naturally delicious and nutritious addition to any recipe! 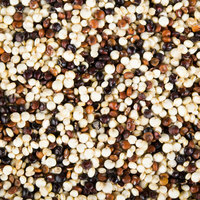 "Quinoa is becoming increasingly popular. It is good tasting and can be used just like rice. It is a good starch for diabetics and is naturally gluten free for those who need to be and others who just care about such things." Quinoa grows in different colors, and although the taste is similar among the varieties, you can choose the color that is appealing for your recipe. This white quinoa is a common type, and it tends to cook up fluffier and faster than the other varieties. 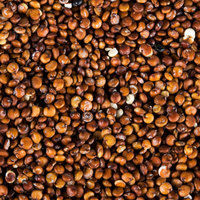 Before cooking, rinse the quinoa under cold water. Pour it in a pan with water, and add a pinch of salt to taste. Place the pan on medium heat and bring it to a boil, then reduce the heat to a simmer for 10-15 minutes. Once the liquid is absorbed, remove the quinoa and fluff it with a fork. 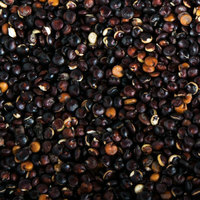 Then this delicious quinoa is ready to serve in your signature dishes and salads! 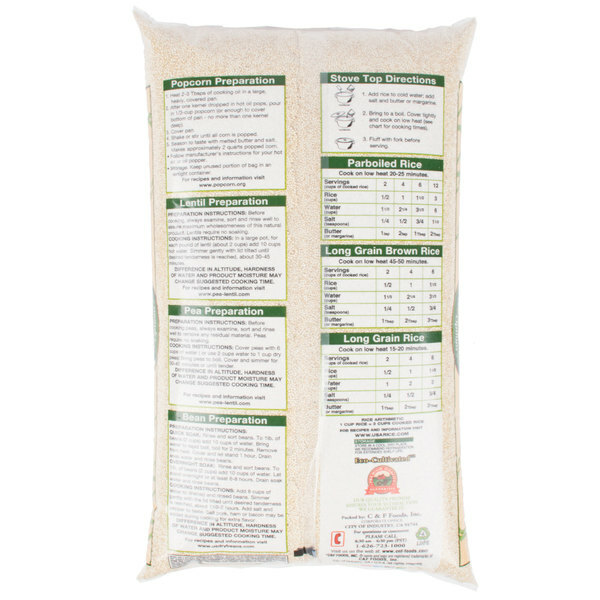 Item #: 111QUINWHORG Organic White Quinoa - 25 lb. Item #: 111QUINBKORG Organic Black Quinoa - 25 lb. Item #: 111QUINTRORG Organic Tri-Color Quinoa - 25 lb. Item #: 111QUINRDORG Organic Red Quinoa - 25 lb. Overall User Rating: Organic White Quinoa - 25 lb. We are VERY PLEASED with this product. We regularly make homemade soup and quinoa pudding with WebstaurantStore's quinoa. It tastes delicious, and is a wonderful protein source. It is very satisfying to have added this to our diets, and it is great that WebstaurantStore offers this organic option. 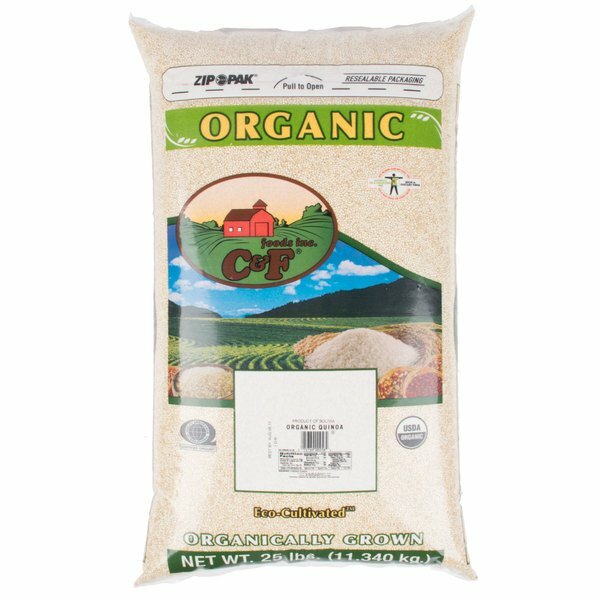 For the soup, we also add WebstaurantStore's organic brown rice, which is another great find. The quinoa has kept well for MONTHS for us, after putting it in lidded storage containers upon receipt. We purchase for household use, so it takes us a bit to get through the quantity. It has been a great addition to our pantry, and we are so grateful for the chance to stock up and not have to make a million trips to the store. Quinoa is becoming increasingly popular. It is good tasting and can be used just like rice. It is a good starch for diabetics and is naturally gluten free for those who need to be and others who just care about such things. I really like this brand of quinoa. I make quinoa a lot so buying in bulk as been so much cheaper and the bulk prices on webstaurant are even better than the box stores. this organic quinoa is really great. it cooks up perfectly fluffy and separate every time and it's nice to be able to get an organic product at such a reasonable price. delicious! 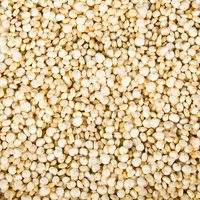 This white quinoa is organic and they are like fresh from the farm in the harvest month. The price is good for organic quinoa and there are a total of 25 lbs of this high quality food. The shipping is reasonably fair. I will buy again. I wish they had a better way of shipping these, mine emptied out into the box it was shipped in and ended up everywhere. Other than that, I was able to salvage most of it and it’s still a great buy for the amount you’re getting. You’ll pay 2-3 times as much in the grocery store. Great quality quinoa, it's really clean and there are no random foreign objects or soil. When it's cooked it comes out very fluffy and but still maintains a good texture. This is also the best priced per pound organic quinoa on the market, I've looked everywhere. The packaging is really great too because it has a sealer making it easy to access without spilling. Delicious! Inexpensive, especially for organic quinoa! This was my first time using quinoa. I made an organic apple-raison cinnamon quinoa hot cereal for breakfast today! My kids say it was: "Amazing!".... "Not good, but great!".... "Awesome!".... "A billion times yummier than yummy!" I think it is safe to say they liked it! 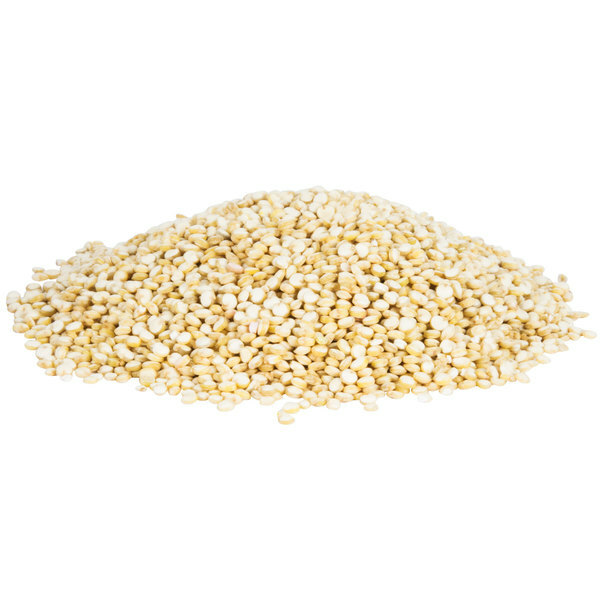 This organic white quinoa is a healthy, great tasting meal that goes a long way. You can create all sorts of flavors with this product by adding different spices to it. We love quinoa. This Regals Foods white quinoa is organic so it is really good. The 5-lb bag is nicely price as well. You can never go wrong with this quinoa. This sure is some yummy Quinoa. A full 5lb box of organic Quinoa is a super deal. This makes a tasty side dish for any meal and is quick and easy to prepare. I'm very satisfied with the product, my only concern is that it came in an unmarked plastic bag sealed with a twist-tie, which means there's no proof that it's organic. I'm taking the seller's word for it, but it would be nice if there was a label with the USDA organic seal on the package ... or any label at all, for that matter. This is good quality quinoa at an excellent price. It's as good of quality as any quinoa I've bought anywhere else, but for even cheaper. I still wash it two or three times, quinoa can cook up a bit bitter/soapy if you don't. You Can't beat the price on this Quinoa. The white cooks faster than other colors which is a plus for me. Very good quality and value. Oh wow, just like the expensive store brought small batches that I tried weeks ago. I have experimented with vegetarian dishes that call for this ingredient. This 5 pound box of organic white quinoa is a great side dish for any meal. 100% organic this comes packaged in a plastic bag inside of a cardboard box for safe delivery. Taste great! Very recently I got introduced to quinoa (pronounced as Keen-Wah) and I am really enjoy eating it. The Organic White Quinao of it is of excellent quality, it cooks up nicely in about 20 minutes. The flavor of quinoa is subtle and a little nutty, allowing it to play well with savory and sweet ingredients. One of my favorite salads uses Quinoa, Avocado, Golden raisins, Almonds, Jalapeno pepper, Capsicum, Tomatoes and Onions, with a dressing made of Lime Juice, Organic Coconut Oil, Mayonnaise Ranch, Black salt and other spices for taste. Delicious quinoa and fresh! This hearty grain is really full of protein and fiber and vitamins. It is super healthy and fully gluten free so that you can make wonderful dishes for everyone without worrying about calories!